CFIS Alumni is a non lucrative association that borns at 2012 by own initiative of some old alumni of the Superior Interdisciplinar Formation Center (CFIS). Between their finalities is found the promote of the interaction in between students from the last years and graduates from CFIS in order to create oportunities at laboral and academic world as well as enhance internationaly the CFIS brand as a synonymous of excelence in the polythecnic ambit. Boost relation and cooperation between their members. The development of all kind of activities and services that contribute to defend the interests of their associates and facilitate their professional development. Contribution to the CFIS progress and improvement of quality in all their activities, as well as give support and promote the professionals that are formed. Collaboration with the CFIS to boost the permanent formation of old alumni. Promote the relationship with those entities, companies, administrations and other association and formative centers that redound in benefice to the CFIS Alumni. Promote the relationship in between students and ex-students from the CFIS by organizing events, the Mentoring Program and other activities. To unveile the CFIS brand as a synonym of excelence, quality and leadership in national and international level. CFIS borns at 1999 offering a double Degree with Telecommunications and Maths at UPC. 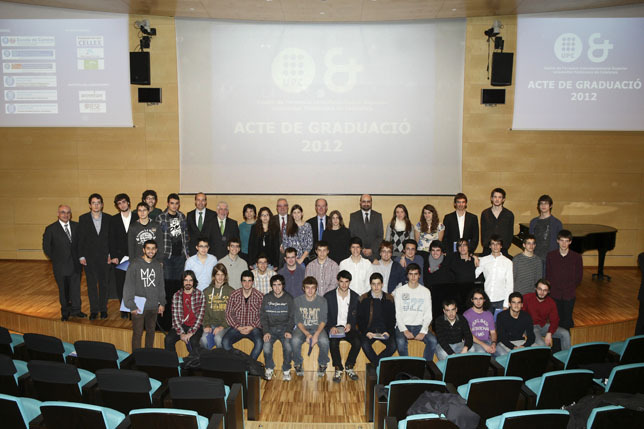 Since 2003 expanded the range of double degrees with the engineering of the UPC. Since then CFIS has formed brilliant students that in a short time have been positioned in the best institutions and companies around the world, have founded their own personal projects or are highlighting at academic world. At 2012 began the gestation of CFIS Alumni by own iniciative from some ex-alumni. At 2013 statuts are defined and is registrated oficially as association. As well at 2013, coinciding with the 10th anniversary of the constitution of CFIS as another center inside UPC, CFIS Alumni starts with strength their activities by publishing this website and organizing the traditional CFIS Christmas dinner. CFIS Alumni is a non lucrative association that offers the old alumni the possibility to be in touch with classmates of promotion, meet students and graduates from other promotions and, consequently, create a rich and dynamic net that helps to improve academic and professionaly. Keep professional and social relationship with CFIS, as well as their students and ex-students. Attend to two annual networking acts. Receive a monthly newsletter focused on CFIS around and their ex-students. Appearance at the official booklet and the CFIS Alumni website, improving with this the visibility to the companies. Participate in all activities organized by CFIS Alumni. Connect with important companies through workshops, seminars and acts. And, first of all, collaborate in order to achieve CFIS Alumni goals and promote the CFIS brand at a mundial level. Besides, by the fact of being CFIS Alumni, immediately you'll be part of UPC Alumni Premium. Among the advantages you get there are many discounts that will compens the annual fee. Other advantages are Professional Careers, job notice board, formation, languages, libraries, activities, promotion activities, clubs, etc. See all the benefits of UPC Alumni Premium at: http://alumni.upc.edu/altres-avantatges. Do not hesitate, join us!! JOIN US AS A MEMBER! !